CARATTERISTICHE 1.Elemento sonoro di alta qualità .Il diaframma super sottile selezionata come anche il fissaggio degli elettrodi lavorati attraverso la tecnica di incisione dei tre strati di acciaio usando la diffusione di calore e stato utilizzato per la nuova SR-L300. Quindi la ricchezza delle basse frequenze , il delicato suono delle alte frequenze e il suono calmante delle medie frequenze sono riprodotte in maniera bilanciata. 2.Archetto con regolazione a scatto .L’archetto della SR-L500 è equipaggiato con il meccanismo di regolazione senza scatti per la regolazione in altezza dei padiglioni. 3.Cavo a bassa capacita OFC. Per il nucleo sono utilizzati nuovi cavi OFC di alta qualità. Il cavo ha la struttura piatta parallela in modo da abbassare la capacità tra i fili. 4.Padiglioni in pelle artificiale di alta qualità. La pelle artificiale e flessibilità dei padiglioni non solo implementa la vestibilità ma contribuisce alla “freschezza del suono” e “grazia del suono”.Cuffia push-pull elettrostatica , chiusura apertaesternamente , risposta in frequenza 7- 41.000Hz,cuscinetti in pelle artificiale di alta qualità.Peso :448 g con cavo, 322 g senza cavo. (NEW)The first SR-Λ (lambda) series was introduced 30 years ago, and now the SR-307 and SR-407 have adopted the same sounding body (sound element) as that of the top model SR-507. The conventional sound element has employed simplest structure so that as wide film diaphragm area as possible can be effectively used in comparison with its external size. Taking advantage of the conventional feature, the new sound element has been packaged in a tough resin case. Thus the new sound element has realized cleaner sound and better reliability. Also a new thin-film material (super engineering plastics) almost free from stretch through temperature or humidity has been adopted, enabling both the rich, deep low frequency and the delicate high-frequency sound. La prima serie SR-Λ (Lambda) e stata introdotta 36 anni fa e da allora e stata sviluppata nella nuova generazione SR-Λ (Lambda) con un nuovo design meccanico –La Nuova SR-L500 Advanced Lambda . CARATTERISTICHE 1.Elemento sonoro di alta qualità .Il diaframma super sottile selezionata come anche il fissaggio degli elettrodi lavorati attraverso la tecnica di incisione dei tre strati di acciaio usando la diffusione di calore e stato utilizzato per la nuova SR-L500. Quindi la ricchezza delle basse frequenze , il delicato suono delle alte frequenze e il suono calmante delle medie frequenze sono riprodotte in maniera bilanciata. 2.Archetto con regolazione a scatto .L’archetto della SR-L500 è equipaggiato con il meccanismo di regolazione a 10 scatti del poggiatesta in modo che una volta regolato non e più necessario intervenire. Questo permette un ottima vestibilità e l’ascolto confortevole anche per lunghi periodi di tempo. 3.Cavo a bassa capacita HiFC. Per il nucleo sono utilizzati nuovi cavi HiFC di alta qualità. Il cavo ha la struttura piatta parallela in modo da abbassare la capacità tra i fili. Questo implementa la “freschezza del suono”. 4.Padiglioni in pelle artificiale di alta qualità. La pelle artificiale e flessibilità dei padiglioni non solo implementa la vestibilità ma contribuisce alla “freschezza del suono” e “grazia del suono”.Cuffia push-pull elettrostatica , chiusura aperta esternamente , risposta in frequenza 7- 41.000Hz,cuscinetti in pelle artificiale di alta qualità.Peso :465 g con cavo, 339 g senza cavo. The first SR-Lambda series was introduced 36 years ago and it has further developed into a new-generation SR-Lambda with its newly designed enclosure - the new SR-L700 advanced-Lambda series Earspeaker. 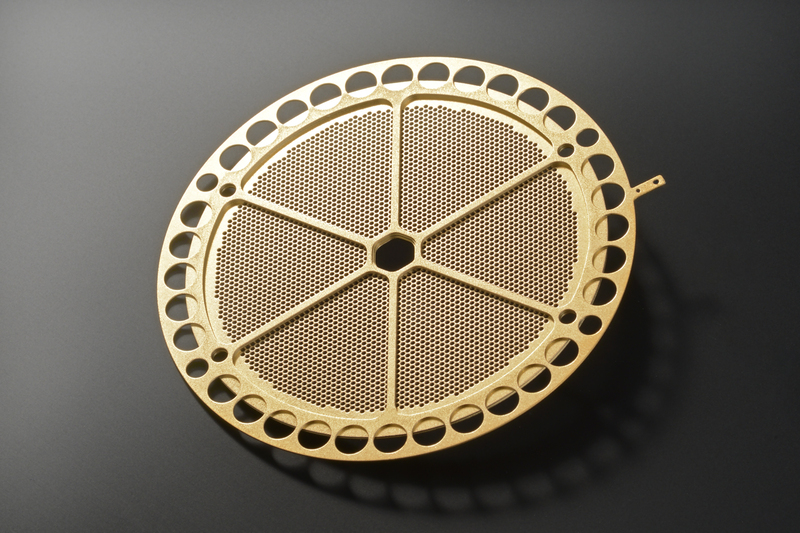 The SR-009 hand selected thin-film diaphragm as well as fixed electrodes machined through three-layer stainless etching using heat diffusion has been employed for the SR-L700 sound element. Thus, rich deep bass response, delicate high frequency and soothing mid-range has been achieved in a balanced sound. 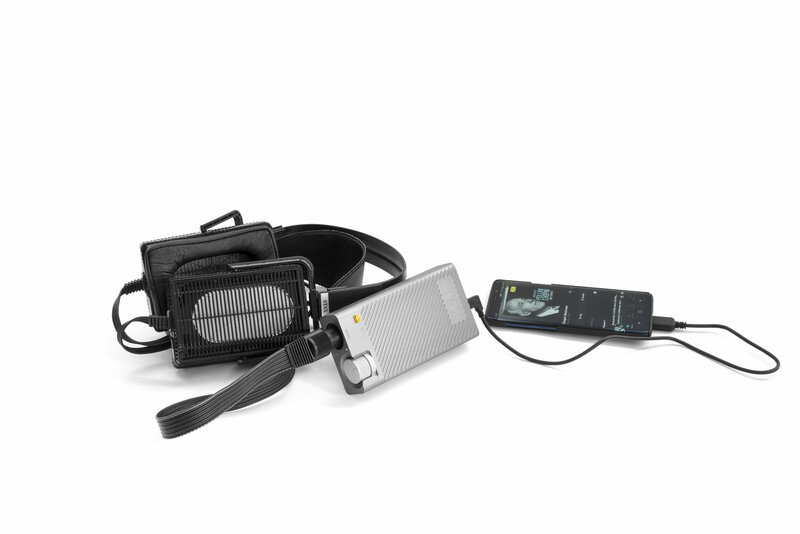 The headband (ARC) assembly of the SR-L700 is equipped with 10-click slider mechanism for head pad height adjustment adopted from SR-009. Once adjusted, the slider always maintains its optimal position to make readjustment unnecessary. 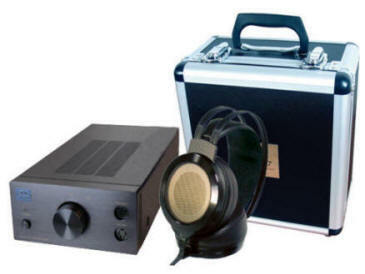 This enables you to enjoy hours of pleasant music listening with utmost comfort.Technical Specifications : •Type: Push-Pull Electrostatic Open-Back Earspeaker•Frequency response: 7 - 41,000Hz•Impedance: 145k O (including cable, at 10kHz) •Electrostatic Capacitance: 110pF (including cable) •Sensitivity: 101dB / 100V RMS at 1 kHz•Maximum sound pressure level: 118dB / 400Hz •Bias Voltage: 580V DC•Left & Right Channel Identification: 'L' and 'R' indicated on the arc assembly •Ear Pads: Genuine Lamb Leather (direct skin contact), high-quality synthetic leather (surrounding portion)•Cable: Silver-coated 6N (99.9999%) OFC parallel 6-strand, low-capacity special wide cable, 2.5m full length •Ambient Temperature & Humidity: 0 to 35ºC / 90% max. without condensation •Weight: 0.8lb without cable / 1.1lb with cableFeatures : •The SR-L700 employs a new sound element which is encased in a tougher resin to minimize vibration•New style ARC assembly. A new 10-click slider mechanism for pad adjustments achieves optimum comfort. 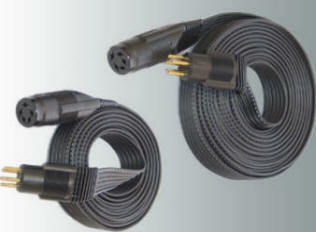 Once adjusted, the slider will maintain its position so readjustment is unnecessary•Low-Capacitance wide hybrid cable. Silver plated copper wire. •Genuine leather ear pad. Lambskin earpad for utmost comfort. STAX 80th anniversary 3rd model The SR-009 is a memorable model that appeared in 2011 and became the foundation of the present STAX flagship Earspeaker development. At that time this extraordinary Earspeaker attained a big success as the model that materialized the idea that has been embraced by STAX developers in pursuit of further improvement of sound quality. 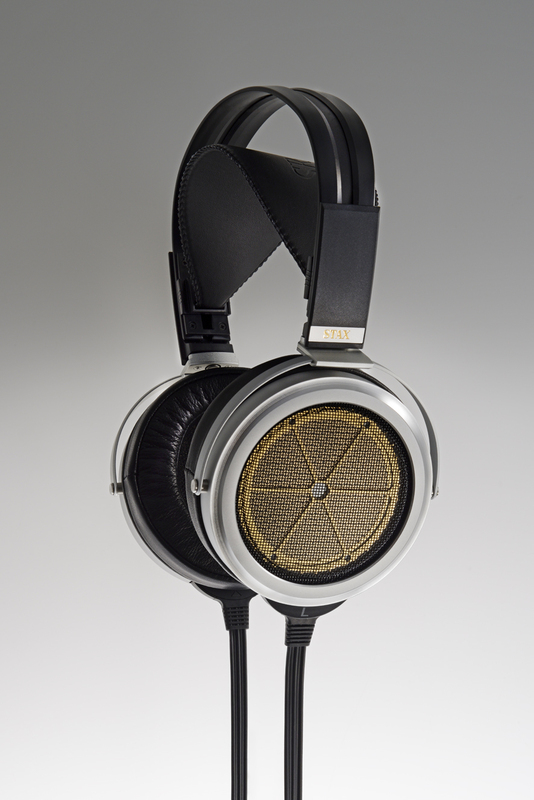 The memorable model that has achieved the highest peak sound of the STAX present new flagship SR-009S will soon be followed by the SR-009BK as the 80th anniversary limited model in special black color version. The SR-009BK in black finish is the limited production of 180 units in the whole world. Sistema composto dalla cuffia push-pull –SR-207 e dall’amplif. 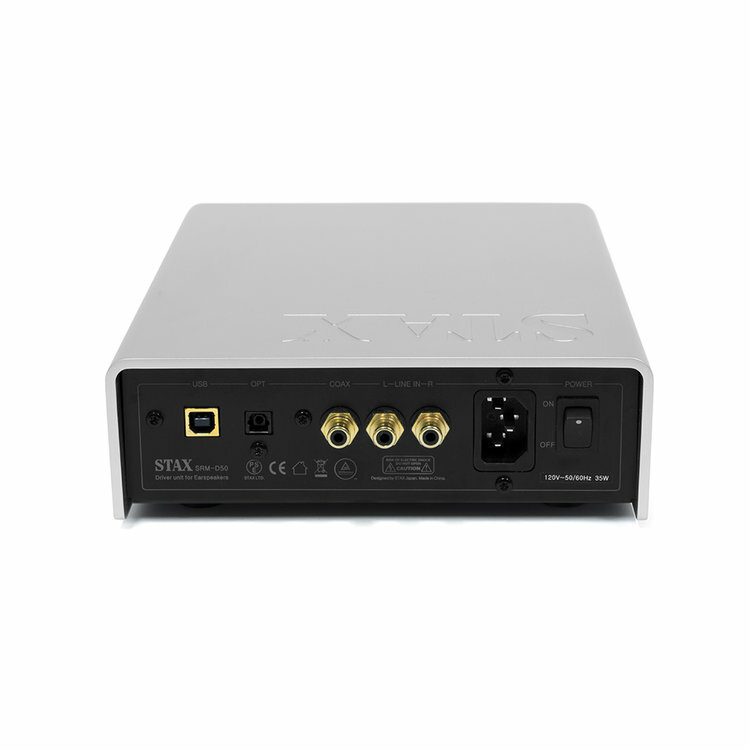 SRM-252S CUFFIA: Risposta in frequenza: 7Hz-41 kHz- Capacità elettrostatica 120pF(cavo incluso) –Impedenza132 kohm (cavo incluso a 10 kHz) - Sensibilità 101dB/100Vr.m.s. – Tensione di polarizzazione 580V DC – Padiglioni in pelle sintetica di Alta Qualità – Cavo : mt.2,5 – Peso 340 gr – 490 gr con cavo AMLIPLIFICATORE :Risposta in frequenza DC-35 khz+0,-3 dB Gain 58 dB, THD 0,01%- Livello nominale :125Mv (100Vr.m.s. output) Max voltaggio d’uscita : 280Vr.m.s. (1kHz) –Impedenza d’ingresso : 50kohm Voltaggio standard bias : DC 580 V – Dimensioni :132x38x132 mm (LxHxP) Peso 540 gr. 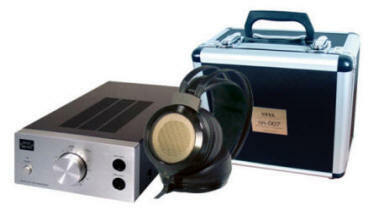 Sistema Composto dalla cuffia SR-007MK2 e dall’amplificatore con tecnologia a valvole modello SRM-007tll - Cuffia di tipo aperta, elettrostatica, Pushpull, Risposta in frequenza: 6 Hz-41 kHz, Impedenza: 170 kohm, Sensibilità: 100 dB/100 V rms, Cavo: 2.5 mt. in PC-OCC a bassa capacità. SR-007 II Specifications: Type: Push-Pull Electrostatic Earspeaker Frequency Response: 6 - 41,000Hz Impedance: 170k Ohms (10kHz) Sensitivity: 100dB / 100V r.m.s. 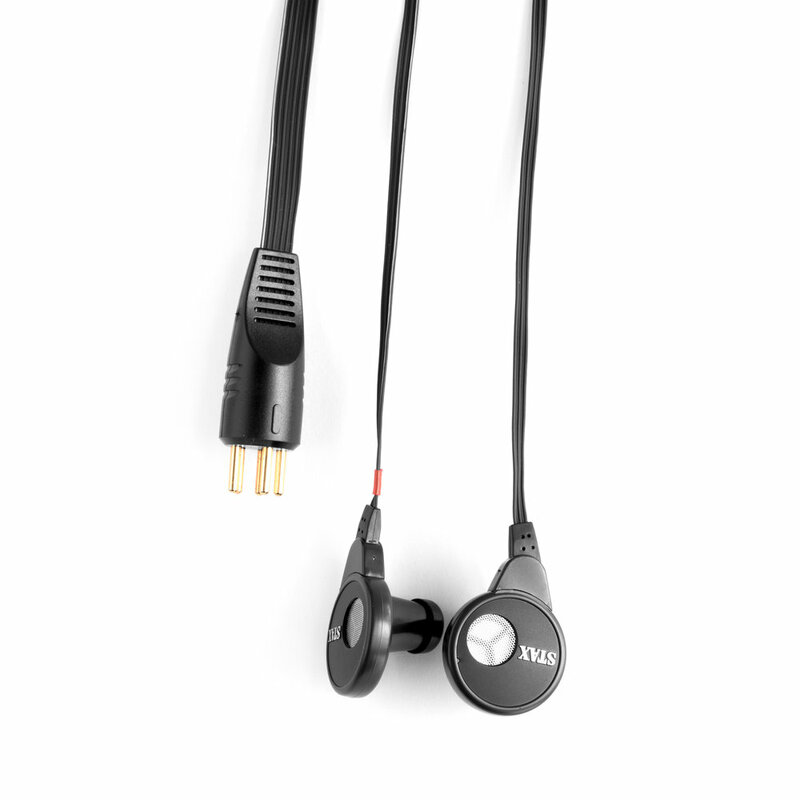 1 kHz Bias Voltage: 580V DC Left & Right Channel Identification: Left (L) and Right (R) indicators are provided at the cable entrance points on the Earspeakers. Left channel cable is marked with a solid Line. Right channel is marked with a dotted Line. 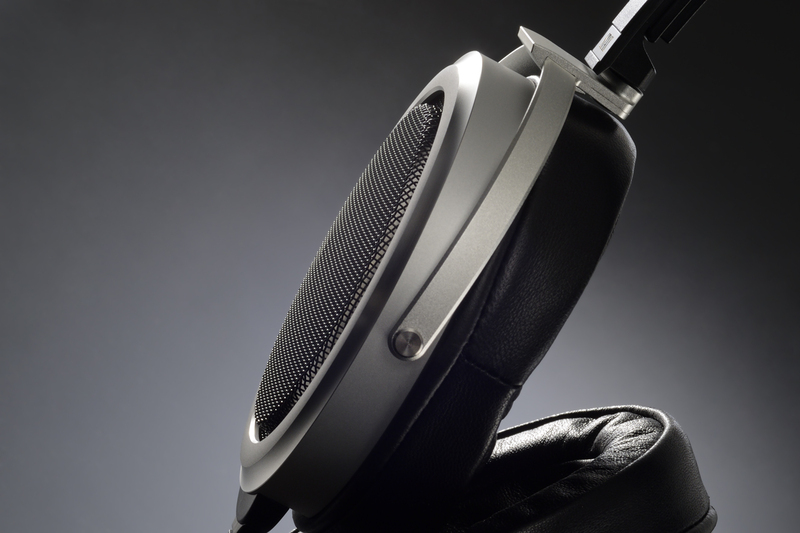 Ear Pads: Crafted from high quality artificial leather for durability and comfort. Cable: Low capacity wide format, PC-OCC (Pure Crystal Ohno Continuous Casting) 2.5m/8.2ft Ambient Temperature & Humidity: 0 to 35ºC / 90% max. without condensation Weight: 12.9oz without cable / 1.1lbs with cables Recommended Driver: STAX SRM-727 2 years Parts and Labor Warranty. 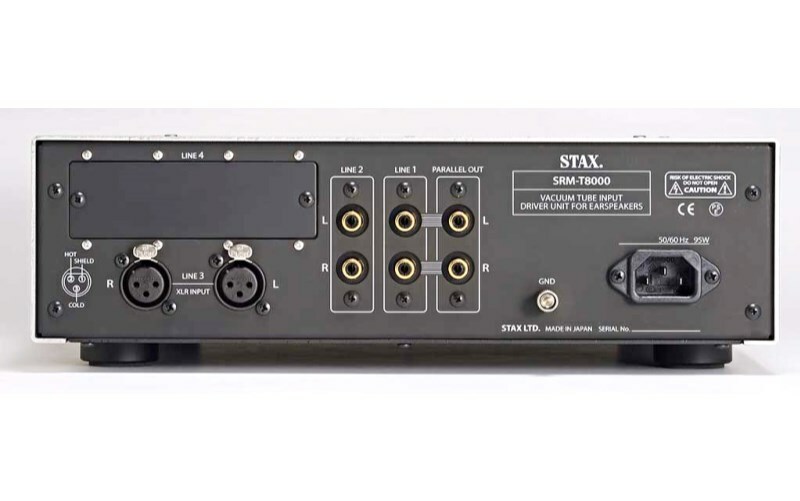 Headphone Amp: Class A, Non-Feedback (Non-NFB) The SRM-727II features non-feedback (NON-NFB) output stage for the first time ever in STAX drivers. Large current emitter follower Class A amplification circuit. This makes it possible to achieve a much more vivid and dynamic sound quality with frequency response raised to 115kHz. (from 100kHz) New Design A newly designed front panel with rounded corners in brushed finish. Available in Silver or Black Pure Balanced System The electrostatic method is a playback method which involves the installation of drive electrodes on either side of a high-polymer film diaphragm with a thickness of only a few microns into each of which a plus signal and a minus signal are fed. 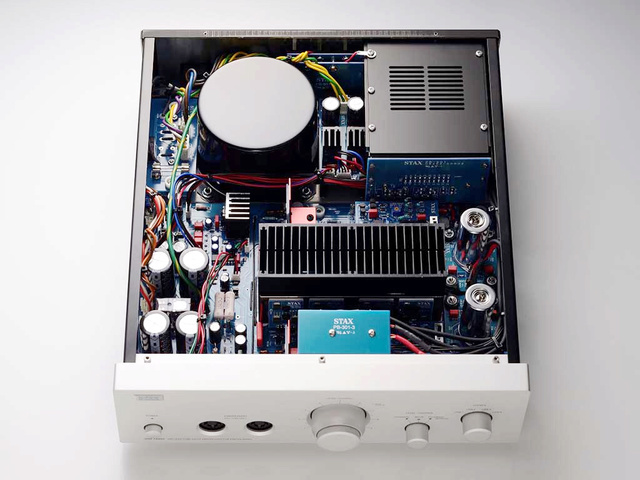 This means that XLR connection with a pure balance output CD player makes it possible to listen to the original sound permitted by the balance system without a conversion circuit. High Quality Parts, High Quality Sound Careful selection of parts with high consideration on sound quality, performance, and the environment. Low noise FET is used at the input stage with a simple two-stage amplifying circuit. 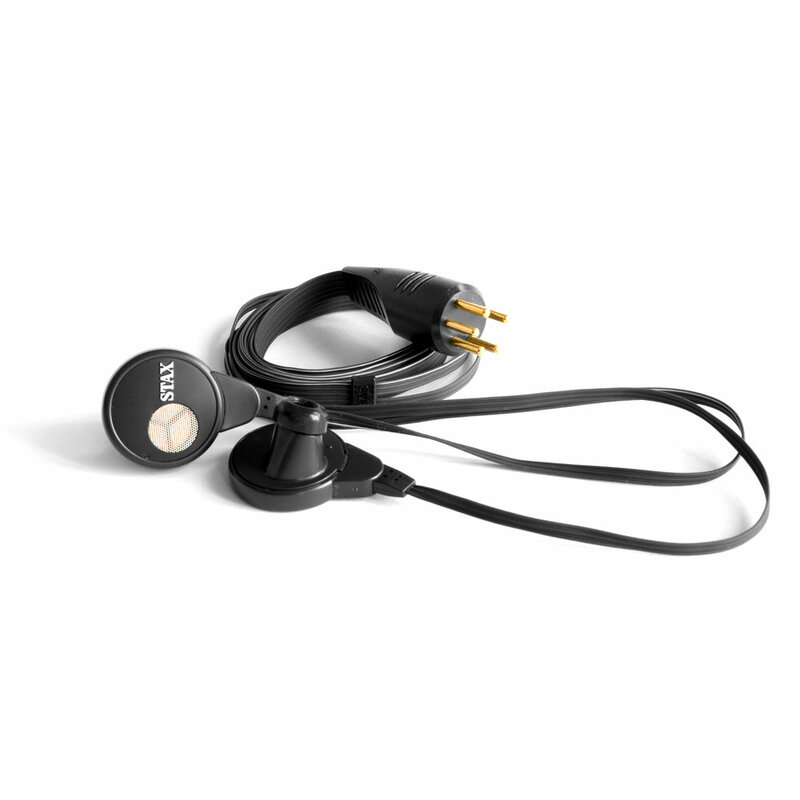 A natural and pure sound quality with high information quantity. Bypass Connection SRM-727II provides a bypass mode that enables "direct" connection to preamplifiers, passive volume controls or integrated amplifiers and receivers with Pre-out. A direct switch that avoids duplication of volume control. SRM-727II Specifications: Type: All-stage semiconductors Low noise dual FET input NON-NFB Class A operation, Pure balance DC amplifier configuration Earspeaker driver unit Frequency Response: DC to 115,000Hz w/ either SR-007 or SR-404 High Frequency Distortion: Max. 0.01% (with 100 to 10kHz, 100V r.m.s. output) Gain: 54dB (x500) Input Terminal: RCA or XLR with 1 RCA parallel out Rated Input Level: 200mV (with 100V output) Input Impedance: 50Kohm (RCA), 50kohm x2(XLR)Max. Output Voltage: 450V r.m.s. 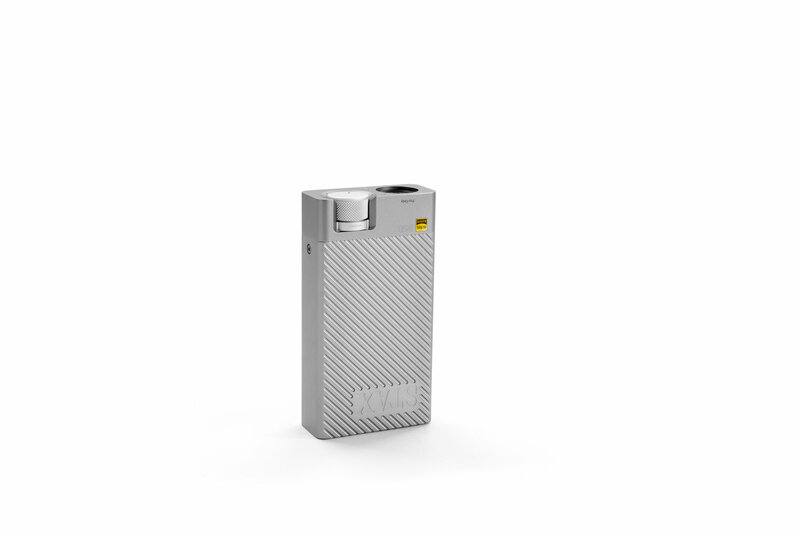 (1kHz) Consumption: 46W Ambient Temperature & Humidity: 0 to 35ºC / 90% max. without condensation External Dimensions: 7.7 (W) x 4.1 (H) x 16.5 (D) in Weight: 11.5lbs Black Earpads and cord to match SRM-007T II with Black Faceplate Color: Black XLR terminal polarity: No. 1: Sealed; No. 2: Hot; No. 3: Cold 2 years Parts and Labor Warranty. 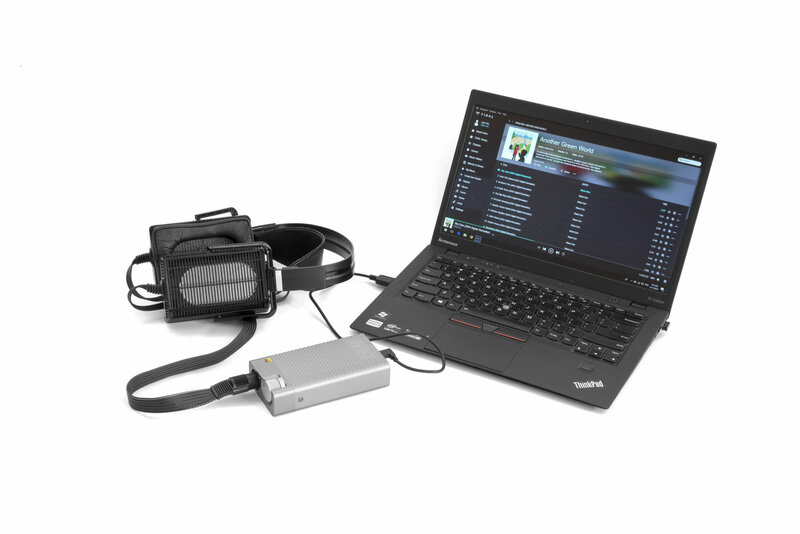 STAX SRM-D10 Battery-Powered Electrostatic Headphone Amp/DAC The SRM-D10 is the world's first compact electrostatic amp/DAC. 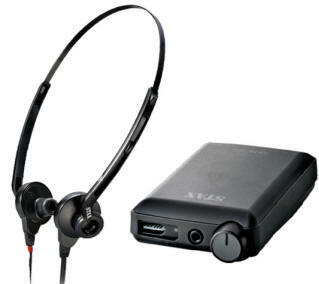 Now, you can enjoy the freedom of using all modern Stax electrostatic headphones (PRO bias) anywhere you go. 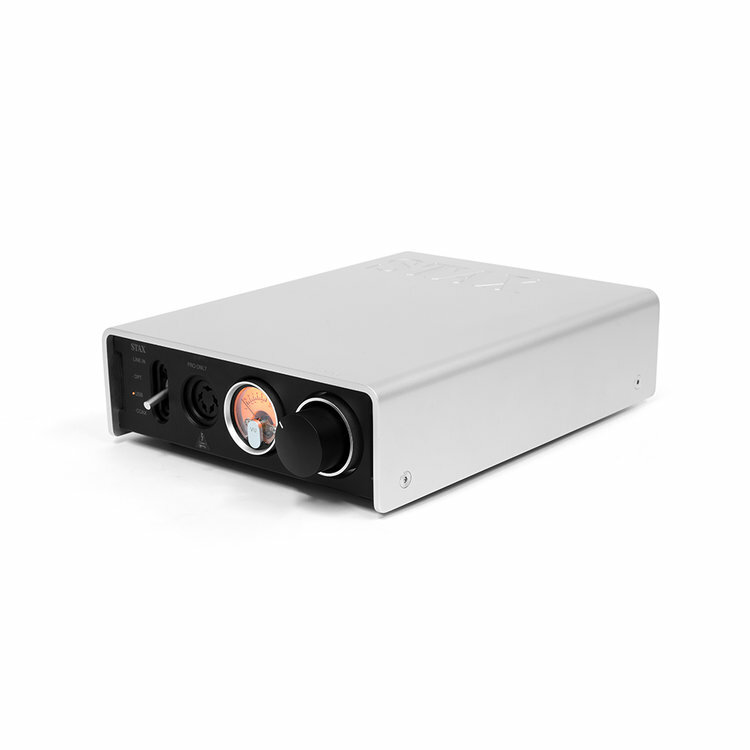 The built-in high-resolution DAC is capable playing up to DSD128 files. La prima caratteristica richiesta ad un sistema audio e la capacità di trasformare le vibrazioni dell’aria in onde sonore in modo che perfino il segnale più fine possa essere sentito dall’orecchio. Questo vuol dire che una condizione essenziale dell’ambiente che crea la vibrazione sonora , i.e. il diaframma, in un diffusore che è il sistema che trasforma il segnale elettrico in vibrazioni, e quella di essere il più sottile possibile. Nel caso dell’azionamento ancorato in un solo punto del diaframma il frazionamento delle vibrazioni che e inevitabile e possibile cosi come e possibile anche la miniaturizzazione dell’azionamento totale del diaframma. In più se vengono usate della cuffie , c'è una riduzione della massa d’aria da muovere, si crea una condizione ideale. Il tipo elettrostatico e il sistema che si avvicina di più alla condizione ideale. STAX fa riferimento a diffusori di questo tipo come “diffusori auricolari” ed e alla continua ricerca della forma ideale. Per questo e necessario un unita driver dedicata e lo sviluppo di questo tipo di driver equivale all’inseguimento dell’alta qualità audio nei sistemi del trattamento del segnale elettrico. L’accoppiamento del sistema driver e del sistema d’amplificazione e utilizzato per pilotare i diffusori elettrostatici ed caso degli amplificatori e possibile costruire circuiti basati sulle valvole. Nel caso del sistema di trattamento del segnale elettrico, in generale si sa che la qualità dell’audio varia in base alla configurazione dei circuiti , componenti etc. Quale va scelta? Nello stesso momento c'è anche la componente musicalità da tenere in considerazione per determinare il suono che è la ragione d’essere del audio. Il nuovo SRM- 727II utilizza lo stadio di pilotaggio a semiconduttori e include uno stadio d’uscita non-feedback per la prima volta da sempre in un amplificatore STAX. La configurazione bilanciata pura DC dello stadio d’uscita in classe A e usata per l’emettitore comune a larga banda di corrente . Si e acquisito cosi un significante incremento della gamma dinamica specialmente nelle alte frequenze. Attraverso il semplice circuito di amplificazione a due fasi con i FET a basso rumore in ingresso si acquisisce un alto livello di purezza sonora. Questo e un nuovo tipo di driver che apre nuove visioni del senso di massa ed espressione del dettaglio sostenuto da un grado virtualmente ineguagliabile della risoluzione , un senso naturale di apertura e un potente stadio di potenza. Amplificatore a stato solido in Classe A, Pure balance, configurazione in DC, Risp. in frequenza: DC-115 kHz, livello d’ingresso: 200 mV, Gain: 54 dB, THD: 0.01%, Imp. d’ingresso: 50 kohm/XLR balance 50 kohm x2, Ingressi: 1x RCA, 1x XLR (bilanciato), Max. voltaggio d’uscita: 450 V rms, Voltaggio Standard Bias: DC 580V, Dim. : 19.5x10.3x42 cm (LxHxP), Peso: 5.2 kg.